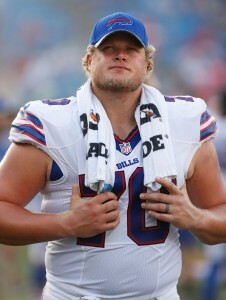 The Bills have officially released center Eric Wood. Wood, who retired earlier this offseason due to a neck injury, has agreed to an injury settlement with the team. Wood, 32, was Buffalo’s starting snapper from 2009 through 2017. Prior to his retirement, he was Buffalo’s second-longest-tenured active player behind defensive tackle Kyle Williams. Over the course of his Bills tenure, he was team’s top center under six different head coaches, or seven if you count Anthony Lynn‘s one game as interim head coach. Remarkably, he started in all 16 of the Bills’ regular season games last season, plus their playoff game against Jacksonville. Wood managed to play through the pain all year, but the malady was too serious for him to continue on the field. Wood graded out as the No. 16 center in the NFL in 2017, per Pro Football Focus’ advanced metrics. In 2015, the season in which he his first and only Pro Bowl, PFF had him ranked in the top five league-wide. With Wood out of the picture, the Bills project to start free agent pickup Russell Bodine in the middle. Interior lineman Ryan Groy figures to serve as his top backup. Patriots tight end Rob Gronkowski was not spotted on the field at Friday’s walkthrough, as Mike Reiss of ESPN.com (Twitter link) notes. Gronk, of course, suffered a concussion in last weekend’s AFC Championship victory over the Jaguars, putting his Super Bowl status in limbo. The good news is that there’s more than a week to go between now and Feb. 4, so the New England star has plenty of time to rest up. The revised deal that Eric Wood signed with the Bills in August grants him $4.8MM in injury guarantees for 2018, as Mike Garafolo of NFL.com (on Twitter) points out. Wood is retiring due to a career-ending neck injury, but he’ll be covered financially. Wood’s retirement or release would increase his cap number to $10.39MM in 2018, but the Bills may opt to designate him as a post-June 1 release, lowering his 2018 hit to $8.225MM and adding a $2.166MM hit in 2019, as ESPN.com’s Mike Rodak tweets. The Bills fired director of analytics Michael Lyons and system analyst Peter Linton, as Tim Graham of the Buffalo News writes. It’s not clear if Bills GM Brandon Beane and coach Sean McDermott will place an emphasis on analytics in their scouting going forward. At the same time, team president Russ Brandon has said in the past that he uses analytics mainly for ticket sales, so the dismissal of Lyons and Linton might not change much of the on-field product at all. Dolphins star wide receiver Jarvis Landry doesn’t anticipate re-signing with the team. Recently, PFR previewed the Jets‘ offseason and the team’s top three needs (Note: This was written before Jeremy Bates was promoted to offensive coordinator). Wood, 32 in March, has been Buffalo’s starting snapper since entering the league in 2009. He stands as Buffalo’s second-longest-tenured active player behind defensive tackle Kyle Williams and has been the team’s top center under six different head coaches (seven if you count Anthony Lynn‘s one game as interim head coach. Remarkably, he started in all 16 of the Bills’ regular season games last season plus their playoff game against Jacksonville. Wood managed to play through the pain all year, but the malady is too serious for him to continue on the field. Wood graded out as the No. 16 center in the NFL last year, per Pro Football Focus’ advanced metrics. In 2015, the season in which he his first and only Pro Bowl, PFF had him ranked in the top five league-wide. We here at PFR wish Wood the best as he deals with his medical situation. The Bills plan to keep Eric Wood around through the remainder of the 2010s, signing the veteran center to a two-year extension, the team announced. Wood was entering a contract year. The 31-year-old center has been Buffalo’s starting snapper since entering the league in 2009. This deal will take him through 2019. The extension secures Wood $16MM in new money, Ian Rapoport of NFL.com tweets. It also adds $5.28MM to his 2017 wages. Wood counted for $7.58MM on Buffalo’s books this season. Rapoport adds (via Twitter) this deal comes with $14.2MM in guarantees. Factoring into these figures: Wood received a $6.5MM signing bonus and will collect a $1.75MM roster bonus next week. This continues to fortify Buffalo’s interior line. The team matched a Rams offer sheet to retain backup center Ryan Groy earlier this year. Groy is signed through 2018. It also answers the question about the Bills’ belief their second-longest-tenured player can bounce back from a broken leg sustained in November 2016. The team’s 2009 first-round pick, Wood will remain entrenched as Buffalo’s starter and one of the cornerstones of a rushing attack that led the league last season. The Bills paced the NFL by nearly 15 rushing yards per game in 2016, averaging 164.4 per contest. Prior to the injury that limited Wood to nine games in 2016, the Louisville product played in at least 14 games in the previous four campaigns. The Bills announced that they have placed Eric Wood on injured reserve. To fill his spot, cornerback Marcus Roberson has been promoted off of the practice squad. In a related move, center Dalton Freeman has been signed to the p-squad. Wood expressed hope last week that he could return if the Bills make the playoffs, but he’s either not healthy enough to do that or the 4-5 Bills felt that they needed the help at cornerback instead. Wood suffered a broken leg earlier this month and after the injury Rex Ryan lamented the loss of “the best center in the league.” While many would disagree with Ryan’s sentiment, it’s clear that he will be missed on the O-Line. Ryan Groy will likely continue in the starting center role. Roberson was just promoted from the Bills’ p-squad in late October but lasted only one game before reverting back to the 10-man crew. Roberson will now resume his spot on the roster behind corners Stephon Gilmore, Ronald Darby, Nickell Robey, Kevon Seymour, and Corey White. Bills coach Rex Ryan says he spoke to Sammy Watkins today and Watkins says he felt “fantastic.” However, trainers are not yet clearing Watkins to practice (Twitter link via Mike Rodak of ESPN.com). The Bills placed Watkins on IR in September but got some good news when they learned that he could avoid surgery, leaving the door open for a late-season return. The wide receiver could potentially return as soon for Week 12, but doctors will first have to give him the go-ahead. Meanwhile, Ryan has yet to discuss whether Eric Wood will be placed on injured reserve with GM Doug Whaley (Twitter link). Wood expressed hope last week that he could return if the Bills make the playoffs. However, the Bills may prefer to have his 53-man roster spot, particularly at a time when the playoffs are no sure thing for Buffalo. After a four-game winning streak, the Bills have now dropped three in a row, putting them at 4-5. Seantrel Henderson, who has been on shaky ground with the Bills organization, could once again find his way to the starting lineup. Ryan told reporters, including Joe Buscaglia of WKBW (on Twitter) that Henderson will be given an opportunity this week after his strong showing on Sunday. Buscaglia (Twitter link) inferred that Jordan Mills‘ starting job could now be in jeopardy with the likely elevation of Henderson. started all 16 games in his rookie season in Buffalo, and had started ten games for the team in 2015 before he was sidelined with Crohn’s. This offseason, Henderson was MIA for a while before returning to the team in the summer. Shortly after coming back, he was hit with a four-game suspension for marijuana use. The former seventh-round pick carries a ~$471K cap number this year and ~$703K in 2017. If Henderson can avoid off-the-field trouble, he could prove to be a remarkable value for Buffalo through next season. Bad news for the Bills as center Eric Wood is done for the season. After last night’s game, coach Rex Ryan announced that Wood suffered a broken leg in the 31-25 loss to Seattle. Ryan was dejected as he told reporters the news, calling Wood “the best center in the league.” That statement may be sprinkled with a little bit of bias, but there’s no questioning that Wood is an integral part of the Bills’ offensive line. The advanced stats at Pro Football Focus have Wood rated as just the No. 29 ranked center in the NFL out of 34 qualified players with a slightly higher score for run blocking than pass blocking. When Wood exited the game in the fourth quarter, tackle/center Ryan Groy was used in the middle. He figures to be the team’s starting center going forward and they may add another offensive lineman to the roster this week. Earlier this year, Wood restructured his deal to help create about $2.5MM in 2016 cap room for Buffalo. The Bills have restructured the contract of center Eric Wood, a source tells ESPN.com’s Field Yates (on Twitter). Woods agreed to convert $3.775MM of his $4.775MM base salary to a signing bonus, and tacked on a voidable year in 2018 to his deal. That shuffling created ~$2.5MM in 2016 cap room for Buffalo. Last year, Wood hit an escalator in his contract that increased his cap number by $650K. By restructuring his deal, Buffalo has successfully negated that increase and then some. Last year, Wood appeared in all 16 regular season games for the Bills on his way to his first career Pro Bowl selection. A first round pick in 2009, Wood has started in every game he’s played for Buffalo. This year, he’ll anchor the O-Line alongside fellow starters Cordy Glenn, Richie Incognito, John Miller, and Jordan Mills. The Raiders need to find a running back to complement Latavius Murray, opines Scott Bair of CSNBayArea.com. Bair lists Chris Johnson, Tim Hightower, Matt Forte, James Starks and Ronnie Hillman as potential fits through free agency. Earlier tonight, PFR’s Rory Parks previewed the Raiders’ offseason in depth and, like Bair, named RB as a position the club could address. Click here for the rest. Reworking quarterback Joe Flacco‘s deal and cutting $9MM off his $28MM-plus cap hit for this year would go a long way toward helping the Ravens make improvements, Jamison Hensley of ESPN.com writes. As of Wednesday morning, the Ravens and Flacco haven’t discussed a restructuring. The notion that Browns center Alex Mack has a clause in his contract preventing the team from placing the franchise or transition tag on him is untrue, according to Joel Corry of CBS Sports. Corry notes (via Twitter) that Mack does have a no-trade clause, though. The 30-year-old is expected to opt out of his current deal in the coming weeks and become a free agent. A pair of escalators affecting the Bills‘ salary cap have been triggered, as Mike Rodak of ESPN.com tweets (Twitter links). Tyrod Taylor‘s cap number this season has increased from $1.3MM to $3.3MM based on an escalator and how his ’16 playtime incentive is treated. Bills center Eric Wood also hit an escalator that increases his 2016 cap number by $650K. Out of their pending free agents, the Titans are prioritizing nose tackle Al Woods and tight end Craig Stevens, Terry McCormick of Cover32.com reports. Woods made a career-high nine starts last season. Stevens has been a Titan since 2008 and is discussing a new deal with the team, per McCormick. Chiefs backup quarterback Chase Daniel is scheduled for free agency, but the club has too many other needs to worry about investing a decent chunk of money in a reserve signal caller, writes Adam Teicher of ESPN.com. Teicher believes it’s time for either Aaron Murray or Tyler Bray to step up and take over for Daniel as Alex Smith‘s top understudy. Although the two have been Chiefs for a combined seven years, neither has appeared in a regular-season game. In a Monday roundup of Ravens news and notes, Jeff Zrebiec of the Baltimore Sun discusses the possibility of the team trading down from the No. 6 pick, and reexamines the likelihood of cornerback Kyle Arrington being released.